People often feel a little intimidated by venison feeling that it is a meat that needs stewing for a few hours before eating. This couldn’t be further from the truth. 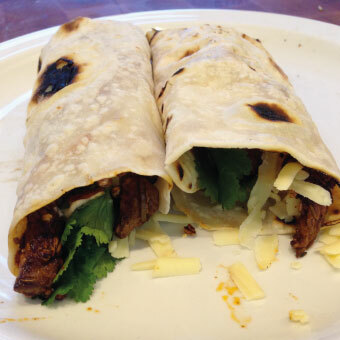 Heres a quick and easy recipe by Tim Maddams that will have you eating delicious fajitas in no time at all. Take a handful of white spelt flour, a splash of water, a teaspoon of veg oil and pinch of salt. Work into a soft but pliable dough, then allow to rest. Roll out thinly and cook briefly in a hot frying pan with no oil until puffed up and lightly coloured. Toast the spices in a frying pan then lightly crush in a pestle and mortar. Cut the venison into strips, slice the onion, chop the garlic and chilli. Sauté in a hot frying pan with the spices, and a little oil, add the veg, garlic, chilli and sauté for another minute or two. Serve with the tortillas and lashings of natural yoghurt, sprinkle with plenty of fresh coriander and make sure you have some nice winter leaves to hand.